The Senate of Virginia is the upper house of the Virginia General Assembly. The Senate is composed of 40 Senators representing an equal number of single-member constituent districts. The Senate is presided over by the Lieutenant Governor of Virginia. Prior to the American War of Independence, the upper house of the General Assembly was represented by the Virginia Governor's Council, consisting of up to 12 executive counselors appointed by the Colonial Royal Governor as advisers and jurists. The Lieutenant Governor presides daily over the Virginia Senate. In the Lieutenant Governor's absence, the President pro Tempore presides, usually a powerful member of the majority party. 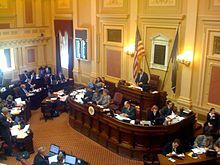 The Senate is equal with the House of Delegates, the lower chamber of the legislature, except that taxation bills must originate in the House, similar to the federal U.S. Congress. Members of the Virginia Senate are elected every four years by the voters of the 40 senatorial districts on the Tuesday succeeding the first Monday in November. The last election took place in November 2015. There are no term limits for Senators. In the 2007 elections, the Democratic Party reclaimed the majority in the Senate for the first time since 1995, when the Republican Party gained a 20–20 split. The Republicans took control of the Senate for the first time in history after a January 1998 special election. The 2011 elections resulted in a 20–20 split between the parties, but as the tie breaker was Republican Lt. Governor Bill Bolling, the Republicans effectively regained control. After the 2013 elections, Democratic State Senator Ralph Northam became the Lt. Governor, but the Democrats did not regain control of the chamber until January 28, 2014, following a series of special elections including that of Northam's vacated 6th district seat. The Democratic majority would prove short-lived, however, as Senator Phil Puckett (D-38th) resigned, effective June 8, handing the GOP a majority of 20 to 19. The Republicans solidified their majority following a special election win on August 19, 2014, which increased their total number of seats to 21. ^ Democrat John Miller (District 1) died. ^ Democrat Donald McEachin (District 9) and Republican Thomas Garrett Jr. (District 22) resigned upon election to the United States House of Representatives. ^ Democrats Monty Mason and Jennifer McClellan sworn in to succeed Miller and McEachin. Republican Marc Peake sworn in to succeed Garrett. ^ Democrat Jennifer Wexton (District 33) resigned upon election to the United States House of Representatives. The Senate's arms have a shield in the center which is divided into four sections by a red cross. In each quarter are smaller shields representing the arms of four countries (England, France, Scotland, and Ireland.) that contributed settlers to Virginia's most early waves of European immigration. 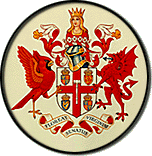 The four coats of arms, a small crest of a crowned female head with unbound hair representing Queen Elizabeth (the Virgin Queen who named Virginia, and the dragon (part of the Elizabethan royal seal of England) represent Virginia's European heritage. An ivory gavel emblazoned on the vertical arm of the red cross represents the Senate as a law making body. The cardinal and dogwood depicted are Virginia's official state bird and tree. The ribbon contains the Latin motto of the Senate, Floreat Senatus Virginiae, which means "May the Senate of Virginia flourish." ^ Walker, Julian (November 9, 2011). "Virginia Republicans claim victory in state Senate". The Virginian-Pilot. Retrieved 2013-01-25. ^ Vozella, Laura (2014-06-09). "GOP controls Va. Senate, will force budget deal". The Washington Post. ^ "Constitution of Virginia, 1776" (PDF). Retrieved January 30, 2014. ^ "The General Assembly Adjourns (1776)". Encyclopedia of Virginia. Virginia Foundation for the Humanities. Retrieved January 31, 2014. ^ "House of Burgesses". Encyclopedia of Virginia. Virginia Foundation for the Humanities. Retrieved January 31, 2014. ^ "Virginia State Legislature" (PDF). VAKids.org. Retrieved 2008-09-12. ^ "Constitution of Virginia; Article IV; Section 6". Virginia Legislative Information Services. Retrieved 2 March 2016. ^ "Legislative Committees". Legislative Information System. Virginia General Assembly. Retrieved 2016-01-14. ^ a b c d Official Virginia State Senate "Capitol Classroom" site Archived 2012-09-26 at the Wayback Machine. Accessed November 7, 2007. ^ a b c d Answers.Com: Virginia State Senate Seal; accessed November 7, 2007. ^ The Queen named Virginia in 1584 by modifying a Native American regional "king" named "Wingina". Stewart, George (1945). Names on the Land: A Historical Account of Place-Naming in the United States. New York: Random House. p. 22. This page was last edited on 22 March 2019, at 09:38 (UTC).